Wow I am so not ready for the holiday at all. One thing I do love about the holiday is all the goodies that are getting baked. 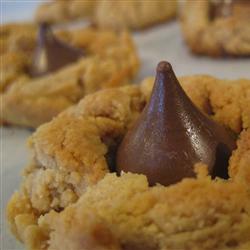 One of my favorite are those peanut butter cookies with the Hershey’s kiss in the middle. OMG yum! Now we all know I can’t cook to save my live but I thought I would share the recipe with you. Enjoy! 2.Mix peanut butter, sugar and eggs until blended. With floured hands, roll level tablespoons of dough into balls. 3.Place balls 1 1/2 inches apart. Bake 12 – 14 minutes. Remove from pan, immediately place chocolate kiss in middle. Cool 1 – 2 minutes.